Lewis Hamilton and Mercedes were peerless in the Spanish Grand Prix. While he had won in Azerbaijan two weeks earlier due to fate and circumstance, his victory in Spain was on merit and flawless speed and execution. Here is how the race unfolded and he won. Hamilton made a perfect start from pole position to grab the lead at the start of the 66-lap race. It was not so perfect for Valtteri Bottas (Mercedes) who lost second place to Sebastian Vettel (Ferrari). Kimi Raikkonen maintained fourth place in the other Ferrari. Red Bull drivers Max Verstappen and Daniel Ricciardo collided while fighting for position in Azerbaijan, but they managed to miss each other in the first turns in Spain. Verstappen was in fifth and Ricciardo in sixth. On lap 1 Romain Grosjean lost control of his Haas, spun and wiped out Nico Hulkenberg's Renault and Pierre Gasly's Toro Rosso. So three cars were out on the spot. While this had no affect on the leaders, it did put the race in a holding pattern until the Safety Car came in at the end of lap 6. Hamilton again jumped into the lead when the race started again. Vettel hung on to second ahead of Bottas, Raikkonen, Verstappen and Ricciardo. Hamilton immediately started to pull away from Vettel, and by lap 13 the gap was up to 6.9 seconds. Most teams wanted to do a one-stop strategy, but they were worried about the tires holding up for two long stints. The top six drivers started the race on the soft compound Pirelli slicks and would switch to the medium compound. But would the second set of tires make it to the end of the race? Ferrari made the first move, bringing Vettel in at the end of lap 17. Mercedes covered Ferrari by having Bottas pit for his set of mediums two laps later. Hamilton pitted at the end of lap 25. So Verstappen took over the lead until he finally pitted at the end of lap 33. Ricciardo had stopped a lap earlier. Red Bull was clearly going for a one-stop strategy. Hamilton was back in front on lap 34 and he comfortably held the lead for the rest of his 66-lap peerless race. The Virtual Safety Car was deployed when Esteban Ocon's Force India smoked to a halt. With the drivers circulating slowly on the track, Ferrari decided to have Vettel pit for a second set of mediums. Ferrari thought Mercedes would do the same. That turned out to be a mistake on Ferrari's part. Ferrari had to hold Vettel in the pit box for 5.6 seconds because Sergio Perez's Force India was going by. That meant that Verstappen was able to move into third ahead of Vettel. "Our tires didn't last as long as for the others, so we couldn't follow the same strategy," Vittel said. "We had to stop again and we obviously lost two positions, and also a bit of time during the pit-stop itself. But staying out was not an option today." Bottas who pitted way back on lap 19 was finding his tires now getting worn and losing grip and heat. Could he hold on to finish second? Barely. It was touch and go as his tires were worn down to the canvas. 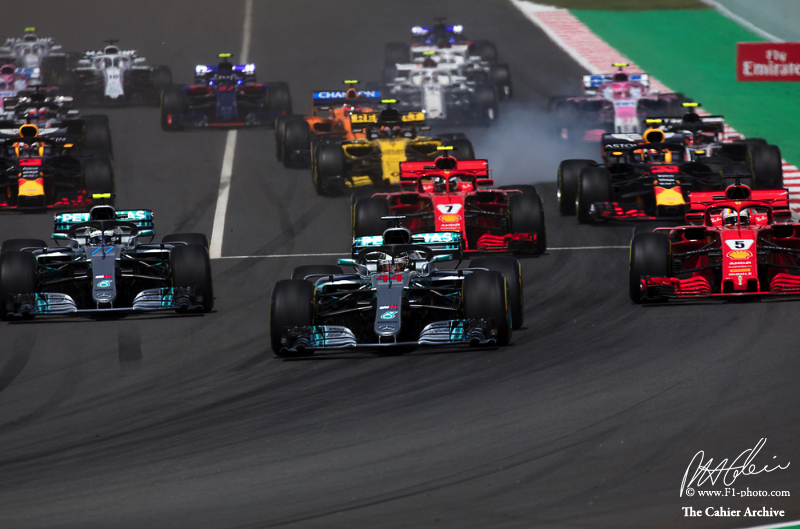 "Before the race we thought a one-stop would be nearly impossible," Bottas said after finishing second, "but when we saw the tyres were holding up better than expected we changed our strategy. Of course I would have rather won." Meanwhile, Hamilton's tires were holding up well and he had no concerns in the closing laps of the race. Verstappen's left front wing suffered some damaged when he hit Lance Stroll's Williams as the VSC period was ending. But the damage was minor enough so that Verstappen did not have to pit for a new wing. Furthermore, he was able to stay in third and ahead of Vettel who had been second early in the race. "He (Bottas) was a bit too far away, but of course I had to keep pushing, because I had Sebastian behind me," Verstappen said. "I just wanted to see how my front wing was holding on, but it seemed alright. It doesn't look as nice but it's alright." There was an 80 percent chance of rain. But the 20 percent "dry" stayed, so there would be no rain showers to cause chaos and mix-up the running order. Hamilton now has 74 poles and 64 wins. He has also now broken another Michael Schumacher record by winning 41 races from pole position. "It's still very surreal," he said. "Every now and then I keep coming up against Michael in terms of records and it just reminds me of just what a great he was."